Protective devices are installed wherever there might be a potential source of contamination. The device is placed in the supply line between the threat and the supply system. A backflow preventer blocks a reverse flow of water if it senses a problem in the regular supply of water. A properly operating supply system moves water by means of pressure "pushing" the water to the end user. As long as the water pressure is higher from the supply side there is no threat of contamination. If for some reason the water pressure direction changes, contaminated water could enter the drinking water system. Why do I have to have it tested? As with all mechanical devices, backflow preventers eventually fail. If the parts wear out or debris gets inside of the backflow preventer and it will not work. Testing will find problems. The general standard for testing is once a year. Tests usually take no more then 5-15 minutes. A mechanical test is preformed along with a mechanical test. During the test the water supply is shut off while a testing gauge is connected to the backflow preventer and backflow conditions are simulated. 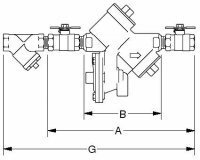 By reading the gauge we can determine if all the components of the backflow preventer are working properly. How do I have my Backflow Prevention Device Tested? Here at Federico Plumbing we are certified by New York State to test backflow prevention devices. Call Us today at (718) 948-6737 or fill out a form to make an appointment.